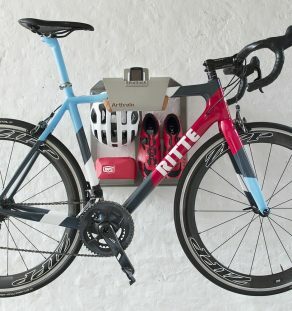 Hanging your bicycle on the wall with the Artivelo BikeDock Urban. It is an advanced and beautifully designed wall mounting bike storage and designed with an eye for quality and simplicity and produced from high quality steel. This stylish and compact bike wall mount allows you to hang your bike and storage your cycling gear elegantly on your wall. Strong 3 mm thick steel, coated with grey aluminium lacquer which is powder coated. The shelve and two hooks adapt to your needs. Artivelo BikeDock Urban is mounted by 4 bolts in the wall and can carry your headphone, sunglasses, keys, lock, gadgets, etc. The inside of the BikeDock, where you hang your bike, is fitted with a brown leather pad with durable foam. This foam cushion is intended to protect and adapts to any type of bicycle. √ Strong 3 mm thick steel. √ The leather foam cushion adapts to most type of frames (sloping or oversized frame, etc). √ Secure your bicycle to your Bike Wall Mount Storage by lock or chain. © 2019 Artivelo - English. All rights reserved.